Can I have some please heheh! I’m feeling cool and refreshed just looking at this lovely, jarred beverage, Carin. You know how I love a cool bevvie on a patio overlooking the water. This is a place up in Scugog. “…A loaf of bread, a jar of marmalade, and thee … singing beside me in the wilderness. Ah paradise enough!” (With apologies to “The Rubiat”! which I’m not even quite sure how to spell.) In other words what an enticing morning scene, with even the possibly of a boat trip in the offing. But WHAT, says me who never quite catches on, is the other orange thingy? A lamp? A wasp-catcher? Or, dare I say it, a red light cleverly disguised to be a “wasp-catcher” of a more political nature??? 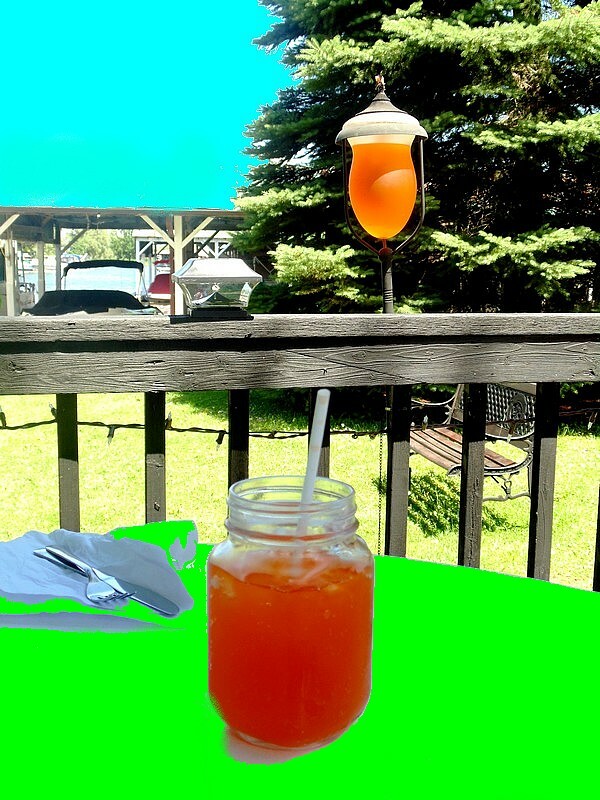 The marmalade is iced tea, but I love your version! A lovely cool drink and maybe a little spin in the boat after lunch? Lovely colours Carin, soft and summery. I’ll have to go back at night and see if it changes colour! Wow! You are doing spectacular things with colour these days. And I see there is a bench in the sun theme this week, at least so far (I’ve looked at yours and Allison’s).